Microdermabrasion is considered the most natural way of regaining youthful looking skin without the use of chemicals, lasers or surgery. It offers a safe and controlled method of skin resurfacing by gently exfoliating the outer layers of skin. An excellent and progressive solution to breakouts, open pores, blackheads, milia, pigmentation, blemishes and acne scars as well as lines and wrinkles. The treatment also helps to increase new collagen and elastin fibres, resulting in a firmer and more toned texture. The gentle vacuum action achieves an immediate lifting effect on tired muscles, just like a workout for the face. Microdermabrasion is an excellent way to achieve smooth, radiant, flawless looking skin and has an immediate radiance and visible difference to your skin! If you do not have regular facials this is the facial for you! Our Microdermabrasion Facials are used with Eve Taylor/Dermalogica. If you wish to have it with Elemis products it will be charged at an extra £10. To see our amazing real life client case results please enquire at reception. This is the perfect facial for a ‘quick fix’. Instant radiance facial perfect to have for special occasions. This facial includes a cleanse, microdermabrasion exfoliation, tone and moisturise with the use of Eve Taylor products that have been prescribed for your skins individual needs. This luxury facial is an ultimate treat for your skin. 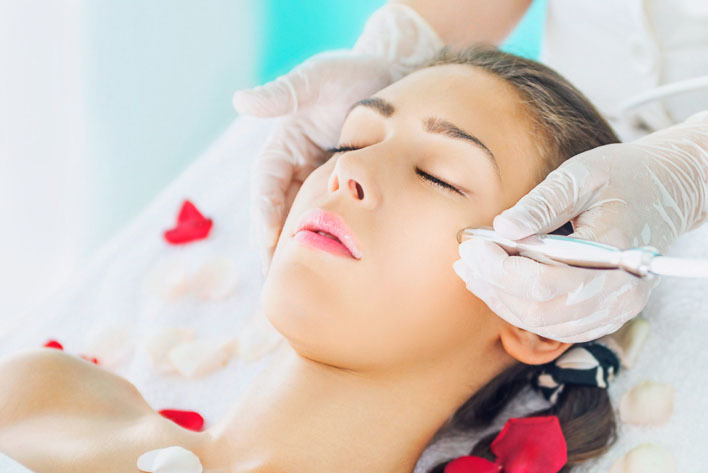 The use of microdermabrasion as well as a completely relaxing facial leaving your skin feeling smooth and looking radiant with an even complexion. Using advanced products this facial is tailor made to suit you skins needs with microdermabrasion exfoliation and use of two masques to create the ultimate facial.